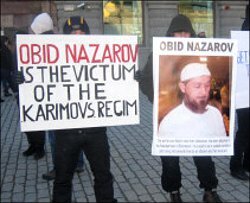 An attempt on the life of Uzbek imam Obidhon-kori Nazarov took place on 22 February 2012 in Stromsund, Sweden. The Uzbek community in Stromsund believes that the imam has been an eyesore for the Tashkent authorities and has called on the imam to be vigilant. The attempted murderer shot the imam at the door of his home, since then, the imam has been in a coma, but is gradually recovering. “Our father is unconscious, but the doctors have said that the danger has passed and his wound is healing,” said the imam’s son Dovud. However, he said that the healing process may take a long time. The doctors have also not given an estimate for the imam’ recovery time. Dovud Nazarov comes to the hospital every day, and sometimes spends an entire day by his father’s bed. The doctors explained it is possible that Obid Nazarov hears and understands those who are near him, but cannot answer them yet. The investigation of the attempted murder has become well known in Sweden. It is not yet completed. On 12 May 2012 Swedish journalist Tord Andersson published an article “Local police did not know that Nazarov was threatened” in local newswpaper Östersund posten, where he criticised the inaction of the police. “The criminal had a lot of time after he committed the crime, important evidence went missing after the stairwell was cleaned. It is absolutely outrageous, when a murder attempt takes place seventy meters away from the police station”, the journalist wrote saying that the police did not have a timely reaction to the shooting. However, the investigation has not quite reached a dead end – articles with new data on the criminal soon began appearing in the press. Two Uzbek citizens went before the Stromsund court in July 2010: the married couple Bahodir Pulatov and Nodira Aminova. They were accused of aiding the main criminal, Yuri Zhukovsky, who carried out the attempt and is being investigated. However, there was not enough evidence to prove their guilt and the Uzbek couple were set free in the court room. Yuri Zhukovsky used the passport of an Uzbek citizen and a drivers’ license issued in the Russian Federation. Media reports talked about his dual citizenship, although it is not officially allowed in Uzbekistan. If Mr Zhukovsky is an Uzbek citizen, then he may be extradited; if he is Russian, there will be no extradition. Moreover, Mr Zhukovsky is suspected of taking part in a similar murder of Fuad Rustamhodzhayev in Ivanonvo, Russia, on 24 September 2011. “I am certain that it was him who had committed the crime. The court needs evidence, but I am not a judge, and can express my opinion without evidence,” Hasan Temirov, resident of small town Timra in Sweden, told Fergana. According to Mr Temirov, Mr Zhukovsky’s guilt and the married couple’s involvement in the crime were already proven before the court. Meanwhile, international prosecutor Krister Pettersson, who is leading this investigation, told the publication Цstersund posten on 16 October, that he can neither confirm nor deny reports on Mr Zhukovsky’s detention in Russia. Uzbek refugees in Sweden are mostly religious activists or ordinary Muslims, who have faced persecution, arrest and even torture for their religious beliefs. Most of the refugees in Stromsund are religious refugees. Muhammasalih Abutov felt that his life was in danger, when a film about him called “Vatangado” (“Without homeland”) was broadcast on Swedish television. It is a strange coincidence that before the life of a well known opposition figure is tragically cut off, the Uzbek media leads a campaign to blacken the future victim’s image. This is what happened to well known journalist Alisher Saipov, and with Obid-kori Nazarov. According to Muhammasalih Abutov, after “Vatangado” was shown on Uzbek television, Swedish police and security services cared for his safety. The Swedish police are currently limiting themselves to these measures to care for the refugee’s safety. It must be noted that Uzbek refugees living in Sweden already have parallel names. “I know many compatriots by one name, but their real names are different. Many Uzbeks a forced to change their real names and surnames,” explained Mr Abutov. According to Mr Abutov, the Uzbek authorities used the “intimidation method” when they organised the attempt on Mr Nazarov’s life, to make sure that the others do not “stick their necks out”. It seems to have worked, because Uzbek Muslims are moving to other regions of the country. A Fergana source in Stromsund, also a refugee from Uzbekistan, told us on condition of anonymity that people have been scared by the events of 22 February (attempted murder of Mr Nazarov), and they are still scared. The source is certain that the person known as Yuri Zhukovsky is the executioner of the criminal plot. “I don’t know if people change their names and surnames, but I can confirm one thing: people are afraid of the Uzbek authorities’ actions, who are widely believed to be able to organise murders even in Europe”. Dovud notes that the life of the community in Stromsund continues even after the attempted murder. Some go to language courses, others look for jobs. Muslim Uzbeks pray for Obidhon Nazarov to be healed. The Uzbek religious community in Stromsund has not even chosen a new leader, hoping for Obidhon-kori’s swift recovery. Mr Nazarov was a well known individual; he was visited by Muslim Uzbeks from Europe and even from the US. Each Saturday and Sunday began with a sermon in the community, discussions of the political situation and methods of political struggle against the Uzbek regime. “Obid-kori knew how to rouse the people, he could convince many of the necessity of political struggle against the Uzbek regime, which of course we do not keep to now,” remembers Hasan Temirov.